The original thread was locked for various reasons so I'm making a new one. Also better to have separate threads for each script. -RS wiki will claim a rate of about 676k per hour although mileage may vary. I find I get around 400k - 500k per hour. Thanks man. Really great script. Just added it for a few of my alts. what is the name of the amulet and ring? and where to get baskets? The amulet is amulet of glory(4). You have a choice between using ring of dueling(8) and ring of wealth(4). You can buy the baskets and the rings/amulets on the ge. 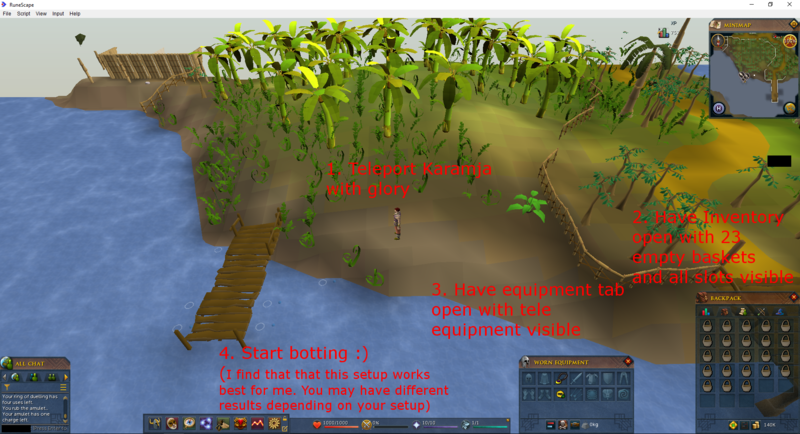 The bot gives you a choice between 3 teleport destinations. 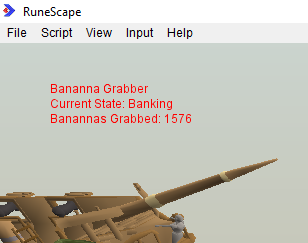 Use ring of dueling if you want to bank at castle wars. Use amulet of glory if you want to bank at edgeville. My bad. I meant no skill requirements. I'll add that to the original post. Nice script! I'll definitly am going to use it. How long does it get stuck on idle? Does it revert back to a working state or does it get stuck forever? I'll take a look at it and do some test runs when powerbot finishes updating then. I'll update the script if I find any problems. How big is your screen when you run the script? A known issue is if you're in fixed mode the bot sometimes can't see things it's trying to click on. I recommend running in fullscreen mode if you're not already doing so. are you running in fixed mode? Try running the script with a bigger view and in eoc mode if you are. I just tested my script and it works on my side. If possible, can you include a picture of your setup? 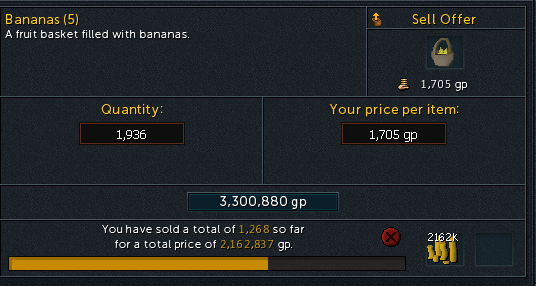 why not use port sarim lodestone, pay fare to bananas, pick bananas, then tele to edgeville lodestone. why not do it this way instead of spending 12k on glory every 2 trips?